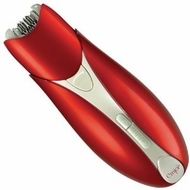 The Emjoi Total Concept is an extraordinary hair remover with 2 products in 1. The epilator features 18 tweezers to remover hair from the root all over the body and the built in tweezers with light are perfect for grooming eyebrows. It is battery-operated, compact and easy to use.